Driving to work the day after Winter Storm Vulcan dumped more than a foot of snow on Burlington, I slowed down to pass a delivery truck parked outside Barrio Bakery in the Old North End. I inched by just as the driver stepped down from the cab onto the icy road. Seconds later, his feet slipped out from beneath him and he slammed flat onto his back. I watched in my rear-view mirror as a man from the bakery rushed to help him. The driver just lay there, holding his head in agony. It's happened. I've reached the phase of pregnancy when everything brings me to tears. Granted, this guy took a pretty nasty digger. (I hope he's OK!) But I don't normally cry over the mishaps of complete strangers. "Timber," the latest hit from Pitbull and Ke$ha, came on the radio and I burst into tears. I just can't explain it. Maybe it was the driving beat? The sassy harmonica? The touching lyrics? The meltdown happened somewhere around the first verse when Pitbull spits out, "This biggidy boy's a diggity dog." 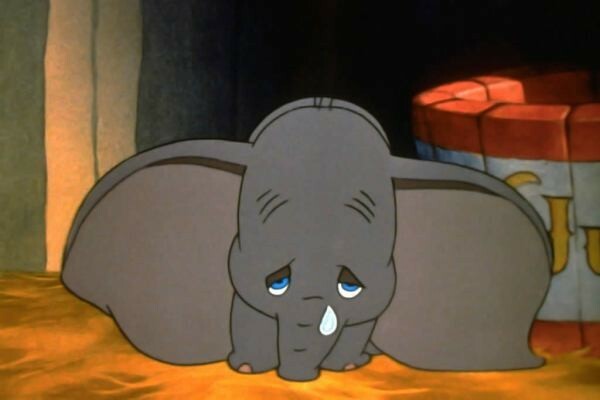 I wept through nearly all 64 minutes of Dumbo. Truth be told, this is perfectly reasonable. My animator husband wanted to watch the 1941 classic and I foolishly agreed. I'd forgotten that it's the saddest story of all time: A baby elephant blames himself for his mother's imprisonment and is forced to perform humiliating circus stunts while the whole world laughs at his oversize ears. When Dumbo tries to visit his mom in solitary confinement, all she can do is stick her trunk through the bars to cradle the poor little guy. Unbearable. I lost it at Shaw's while trying to figure out what to eat for dinner. Pacing the frozen food aisle, I called a few of my nearest and dearest for suggestions, but no one picked up their phone. So I settled on a microwave Indian dinner and a four-pack of chocolate puddings — a new culinary low. I get weepy pretty much every time my one-eyed cat looks up at me and purrs, angling for a belly rub. Plus, she keeps appearing in my wild, hormone-enhanced pregnancy dreams. Usually, I'm nursing her like a human child; otherwise I'm despondent knowing I've abandoned her. And finally, in the tears-of-joy department: I recently reopened my gym membership just so I could swim. Last week I slipped into the warm water in an effort to ease a brand-new back pain. My muscles and joints instantly relaxed. I shot through the water like a seal, my body suddenly weightless. It was total euphoria. So I did what any pregnant lady would do: I sobbed gently into the pool. Megan James is the managing editor of Kids VT. She'll be blogging about her pregnancy until the baby arrives — hopefully in early May.